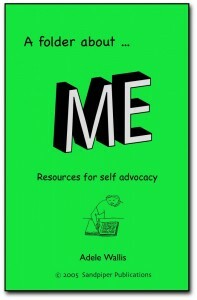 A folder about ME is a set of resource materials aimed at upper primary and secondary school students. It contains 60 pages of work sheets that can be used to help students who have a disability understand their strengths and weaknesses, in order for them to be able to advocate for their needs. It is an excellent set of resource materials for working through transition stages - e.g. primary to secondary school, secondary school to work experience. The work sheets have been organised into four parts. Part 1: This is ME - contains information and facts about the student. Part 2: What I know - contains reports, Individual management programs and information about strengths and disability. Part 3: Things I can do - contains information, strategies, processes that effectively support the student, Part 4: Taking control - contains strategies for taking responsibility over decisions and life directions. Suggestions are provided in the introduction to assist teachers, therapists and support people in implementing this program. All work sheets are provided as blackline masters.